« Is it really only a week since christmas? Meaning back to work, I suppose. Back to feeling exhausted by the weekend and not wanting to do much. Of course, this wasn’t a normal working week. In fact, it was probably harder, physically! I didn’t return to work from the xmas break until Thursday, when I plunged in with both feet, going in to the office in Bristol for a team meeting. The day went fairly fast and wasn’t too bad. I did start to slow down by about 4pm, when I struggled to get my brain running properly, but that’s not bad on my first full Bristol day since early October! Anyway, aside from the work stuff at the end of the week, we were busy throughout the early part of the week too. On Monday we went for a lovely long walk, then Tuesday spent the day at Slimbridge. I realised later that Slimbridge is the furthest I have driven since my op. On Wednesday I looked after Gethin for the afternoon, even dragged him over to Knitting at the Library with me. I didn’t get much knitting done, but it was good to get out and catch up. G fell asleep in the car on the way home, so I clipped the carseat into the pushchair wheels and left him snoozing in the dining room while I made jam tarts for the team meeting at work on Thursday. The jam tarts went down well, all 24 disappearing rapidly. So what with all the walking, driving, baby-carrying, commuting and working this week, I’m exhausted now. It’s a 3-6 month recovery from a hysterectomy, not just the 6-8 week return-to-work time, and I keep forgetting I’m not at full strength. Last night I felt really unwell, like I did a few days after surgery when I tried to lift something too heavy or walked too far. Today I’m a little better, but it will still be a quiet, lazy weekend if I get my way. So, in spite of all the activity, there has been knitting. In fact, I have a little of my knitting mojo back, as I bought a lace knitting book with some of my xmas money. It’s called ‘Wrapped in Lace’ by Margaret Stove, and has some lovely patterns in it, as well as lots of guidance for designing your own patterns. 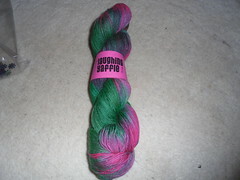 I have lots of lace yarn, can’t seem to help buying it, so I could get on with something lovely fairly quickly. 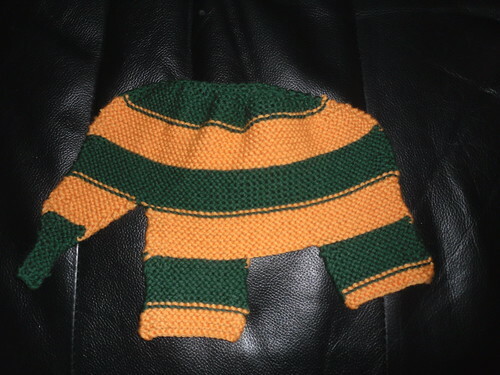 That’s one side of the elephant I’m making for Theresa’s baby. I have already done both sides and started on the smaller sections, so it should be done soon. …and I started a new pair. Now I’m commuting 2 days per week again, the socks should make good progress. As well as a knitting book (and some other books, a CD and a selection of e-books for my kindle), I bought myself a set of digital scales with my xmas money, for weighing yarn. Obviously! Generally I guess whether I have enough yarn for whatever I want to knit, so it will be useful to be able to actually weigh it. By using my xmas money, rather than just our usual money, I can keep them exclusively for yarn and we won’t be tempted to use them (ie get them dirty) in the kitchen. 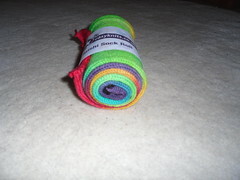 ‘Zippy’, a sushi sock roll from EasyKnits. The sushi sock roll is pre-knitted, then dyed, and you knit socks (or whatever) directly from the roll, unravelling the fabric as you go. It’ll be interesting to see how well it works. I just couldn’t resist the bright colours and frequent changes. 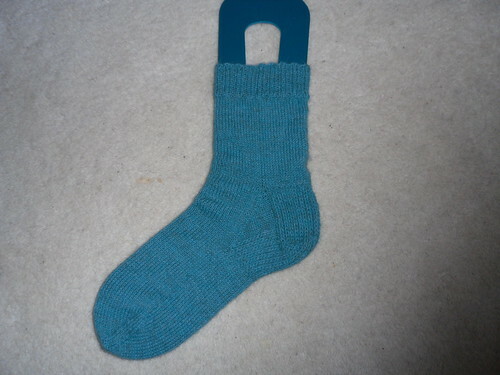 This entry was posted on January 8, 2011 at 11:50 am and is filed under knitting, Work. You can follow any responses to this entry through the RSS 2.0 feed. You can leave a response, or trackback from your own site.